The Center for Integrative Genomics (CIG) is an interdisciplinary research and training institute of the University of Lausanne (UNIL). 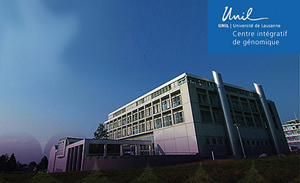 CIG is the latest department of the UNIL Faculty of Biology and Medecine. The research at the CIG centers on genome structure and function in a number of different experimental systems, and a number of different techniques. CHUV IS AN UNIVERSITY HOSPITAL OF EUROPEAN SCALE. - within the public service framework. > a role of hospital for acute and specialized care for the whole population of the canton of Vaud and for a large part of the French-speaking Switzerland. In the research and training areas, CHUV is closely related to the Faculty of Biology and Medicine of the University of Lausanne. In many fields: burn center, organ transplantation, oncology,cardiovascular, AIDS, ophthalmology, neurosciences, etc, the University Hospital complex of Lausanne plays a leading role as the only establishment to offer such a diversity of treatments in the region and by taking part in research or clinical trials for new therapies tested throughout Switzerland, Europe or the whole world.